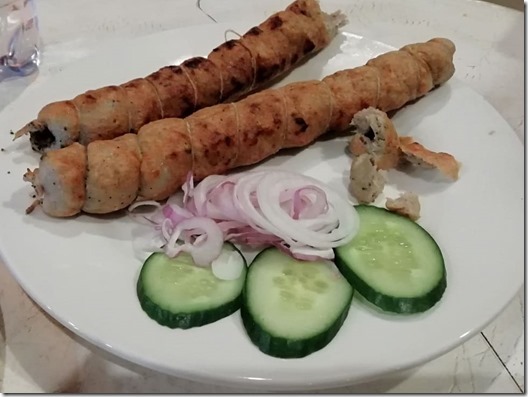 Dhaga kebab is very famous in Karachi. They are very soft and that’s why a thread is used on them to hold the mince on the skewer. Burns road kebabs are very famous in Karachi. You can have these kebabs with parathas and mint chutney. You can take chicken mince, or mutton or beef mince. I took chicken mince. Skip papaya paste if you are using chicken mince. In a food processor chop together the ½ mince, 1 onion, and 2tbsp papaya paste. Now mix in 1tbsp all spice powder, salt as required, 1tsp crushed cumin,2-3 green chilies, 1 fried brown onion, 1/4bunch chopped coriander, and 100g kidney fat and ginger garlic paste. Leave for 3-4 hours. Shape the mixture into kebabs and thread onto to metal skewers and grill over hot Coal. You can also fry them in oil in a pan. Serve hot with parathas and mint chutney.